Putnam County Playhouse: A Talk With Vickie & Jack! Jack Randall Earles & Vickie Parker backstage at The Game's Afoot. If the history of Putnam County Playhouse could be written in the lives of two people, it might be in Vickie Knoy Parker and Jack Randall Earles. Each of them has a history with PCPH going back more than 30 years. We sat down recently to talk with them during a break in rehearsals for the current PCPH production The Game’s Afoot in which they appear onstage as acting partners for the first time in their careers. PCPH: When did you both start your PCPH careers? VKP: My first experience with PCPH was when I played Snow White in Jim Poor’s production in 1967. It was in DePauw’s Speech Hall with a tiny backstage area, a green room, and bats! JRE: In the summer of 1979, I was working part time with my cousin Lita [Barnett] Sandy at her dance studio in downtown Greencastle. One of the other teachers had seen an audition notice for a PCPH revue called An Evening With Cole Porter. She asked me to audition with her, and I was cast as a dancer in the show. VKP: Soon after that I switched my college major from elementary education to high school Speech, Theatre, and English. JRE: One of the cast members in my first show was Ann Cooper. Later in the year she came to the dance studio to take some jazz dance lessons. 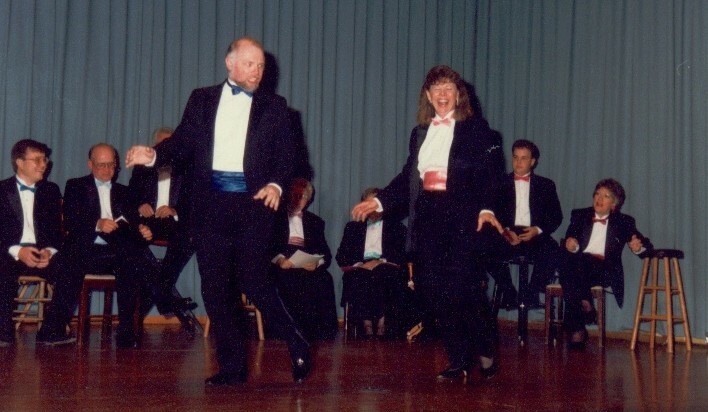 She then asked to me to choreograph the 1980 revue Rodgers & Hart: A Celebration. I was very excited to do it. The music was great. Mark Fields, a DePauw student was the director of the show. 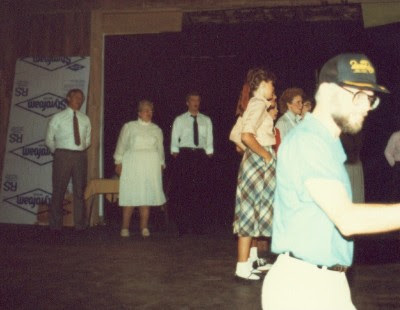 I was also a dancer in the show. PCPH: You’ve told us about your first shows, tell us about your first directors. VKP: Well Jim Poor definitely gave me my love for theater. I also learned a lot from Steve Sommers, and the late Jeff Mont and the late Dr. Jim Elrod. I first worked as the assistant director to Jeff for Hello, Dolly! That show starred my mother as Dolly Levi. Jeff taught me about the sparkle and magic of theatre, and all of my cast members know how important “sparkle” is to me. JRE: Evelyn Robbins was my first director at PCPH. 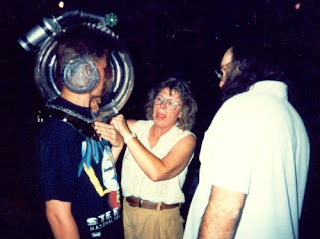 After Mark, I started working with Vickie and Jim Poor. I tell you working with them was an invaluable theatre education. I learned from them how to treat a cast with respect, how to plan a rehearsal schedule, how to block a scene, and how to make all of the elements work. They didn’t sit down and teach me – I watched and learned by following their examples. And Vickie taught me a very important lesson: During the show, a director’s place is anyplace except BACKSTAGE. 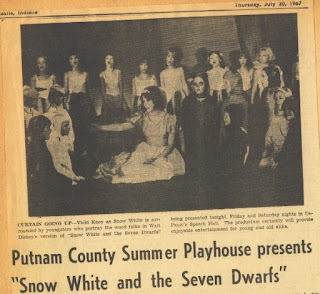 PCPH: What was the first show you directed at PCPH? VKP: My first directing assignment was My Fair Lady  in McAnally auditorium at Greencastle High School – which is now Parker Auditorium, how serendipitous is that? It was a large cast with a full orchestra, and I just jumped in with both feet! 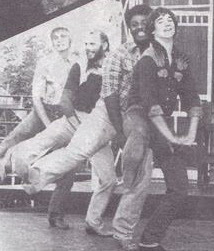 JRE: The first show I directed was The Pajama Game in 1984. Ann Cooper was the musical director and it was so much fun. I also did the choreography. By then I had done a couple of shows with Vickie, so I thought I knew everything! HA! PCPH: When did you two first meet? JRE: Lita introduced me to Vickie, it may have been at the talent show at the Putnam County Fair. I know Lita and I visited you at your house one day when the two of you had some things to talk over, probably about a show you were doing. You had just come back from Florida and you were just so full of energy and theatre that I was hoping we would get to talk again. VKP: I remember you became fast friends with both my mother and me. You went with us once to see the Houston Ballet at IU when they did “Swan Lake.” That was a fun evening. PCPH: What was the first show you worked on together? VKP: In 1981, that was the first year we were out here on the property that we had been given by Mrs. Hazel Longden. We were on the outdoor stage for those first two years. JRE: Lita was the choreographer, and you asked me to be your assistant director. I was so excited. I couldn’t wait to get started. JRE: I role I certainly couldn’t play now! VKP: It’s been more than 30 years, but I still see you on that outdoor stage dancing, holding the ladder for my mother during the auction scene, and stealing scenes whenever you could. JRE: I remember those performance nights, too. It was so great to work with Adeline, too. I had met her during my first show down in the basement at McAnally and she was telling me about how great PCPH was – I didn’t need much convincing. VKP: That show is really my first real memory of getting to know you. JRE: Vickie made us rehearse that auction scene so many times. There was one actor who just couldn’t come in on time with his bid. She didn’t want to call him out in front of everybody, so we all had to do it over and over. I can still see Adeline’s face when Vickie would yell: “Jack, get the ladder, let’s run the auction scene.” What was really great was that Act Two began just as the sun was going down behind the big barn. I could stand holding that ladder and watch Adeline as Aint Eller conducting the auction while the sun set. VKP: Since then, you’ve performed in so many of my shows and done so many characters, but my heart always goes back to Slim. PCPH: What is your favorite show you’ve done together? VKP: We’ve worked on so many shows together. JRE: I’ve enjoyed them all in one way or another. VKP: We’ve always worked in tangent, as equals. I can’t count the number of times after everyone left the theatre, we laughed until we cried, or we were pulling our hair out, and really crying! 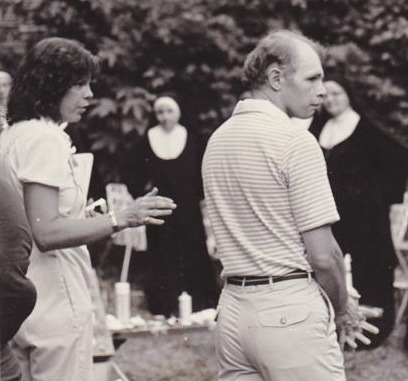 You were my assistant for The Sound of Music in 1982, also on the outdoor stage. You became my voice of reason during rehearsals and the threatening weather. I think that’s when we began reading each other’s minds. Vickie (center) directing Little Shop of Horrors (1994)with Stephen Moell and Greg Stephan. JRE: That was so great. You made me feel like my input was important to you from the first day. That gave me so much confidence. It really translated to my non-theatre life as well. PCPH: Why do you think you work so well together? VKP: We work well together because we have so much respect for each other. We usually come at things from two different directions, but always meet and at the crossroads and then go on the same road together. Of course we don’t always agree. JRE: We’re both a bit hard-headed, but we know that what’s best for the show is always the best solution. After our first couple of shows, we had kind of a shorthand going. We just had to look at each other during a rehearsal to know when something wasn’t working or when it was "right ". Mostly we just made it fun. It can’t be fun for the cast if the creative team is in turmoil. I couldn’t wait to get to rehearsal, and I think our casts felt the same way. PCPH: Do you have any special memory of working together? JRE: For me it’s been the special events, the fundraisers and the Grand Opening of the Barn. 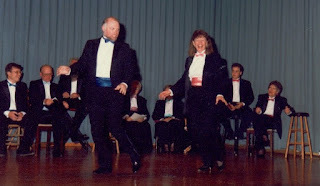 Jack and Vickie dancing during a 1980's fundraiser. VKP: And all of the events during the 50th Season Celebration in 2011. Showboat (1990), Fiddler on the Roof (1991), and Camelot (1993) come to mind. All of them were such solid shows with outstanding casts. 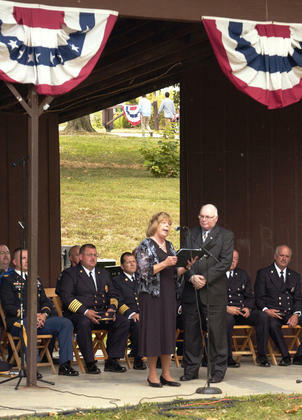 Vickie, Jack, Peggy McClaine at the Mayor's Proclamation in 2011. JRE: And Annie (1984), Kiss Me Kate (1983, 2009), 42nd Street (1996), and now The Game’s Afoot. We finally get to act together on stage playing characters. VKP: After all those years of working together offstage – I think our long standing friendship shows in our characters. JRE: I think one of my fondest memories of working with you was when we spoke at the Remembrance of the 10th Anniversary of 9/11 at Roban Park. Vickie and I read the sequence of events. It was a very difficult thing to do. When we were rehearsing it at the Playhouse, I would always break down when we got to the part about the hijacked airplane and the heroic actions of the passengers. Finally Vickie said: “This is NOT about us – you have to get through this for them.” And she was right….as usual. PCPH: Do you prefer acting or directing? VKP: Over the years, directing has been my first love because I think I direct better than I can act. The most fun is directing AFTER auditions and before opening night! The least fun is auditions – then sitting through the show seeing things I could have done even better! However acting with you, is right up there and equal to my most fun! PCPH: What’s your favorite scene in The Game’s Afoot? VKP: I know you enjoy saying I’m very, very OLD, but my favorite moment is when you realize you’ve said it to my face. I have to work hard to stay in character when I see the look on your face! In fact I love that whole scene. Lots of great interaction between us. JRE: I like that moment, too. There’s also a scene when we say “I love you” to each other as mother and son. It seems like all of these years of working and spending time together is wrapped up in those two sentences. And we say it in front of a couple of hundred people every night! Thanks, Vickie & Jack, for sharing your memories with us. Great interview! Thanks to both of you for years of enjoyment! You have both been the biggest inspirations to me in my theatre life. Thank you for everything you have done through the years for me, and for PCPH, GHS and many other venues. I could never be where I am now without you. I love you both so much! !